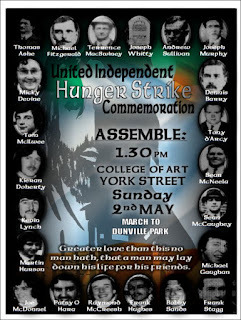 Kateys Diary: Hungerstrike march this Sunday May 2nd 2010. Hungerstrike march this Sunday May 2nd 2010. The Irish News is today reporting that trouble could be expected at a march on Sunday in Belfast which is being called by the United Independent Hungerstrike Commeration. Let us hope the parade is peaceful and passes of in a dignified manner. 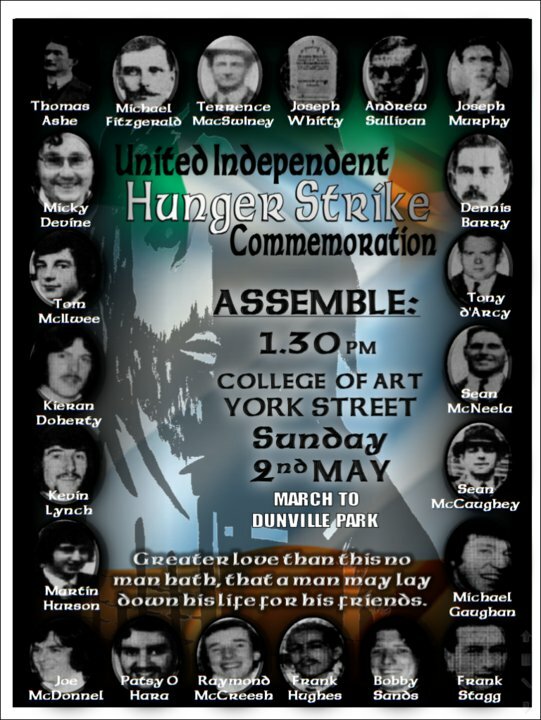 This is afterall to remember the Hungerstrike and a peaceful and dignified parade should be the aim of everyone attending, whether marching or assembling at Dunville. created by Kateyo at approximately 3:01 AM Categories West Belfast. Hungerstrike.